For outstanding backyard decks, the only company to turn to in the O’Fallon, Illinois area is Chelsey Fence & Deck. For decades, we have been custom building and designing premium decks for homeowners all over the region. So, whether you want a quiet retreat to enjoy after a long and stressful week or a lavish backyard space to entertain family and friends on the weekend, you can trust Chesley Fence & Deck to build you the deck of your dreams. Treated lumber decking – Our treated lumber decking is our most budget friendly option that can be sealed and stained. Premium cedar decking – This wood decking option is our lower-maintenance wood option and can also be stained and sealed. 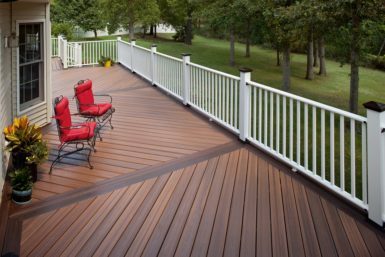 PVC cellular decking – Backyard decks made with our PVC cellular option are plastic throughout, easy to maintain, and outlast most wood decking. Tamko Envision® PVC coated composite decking – This premium decking option boasts many of the same features and benefits as our other synthetic decking option, including incredible durability, but is also backed by a 20-year manufacturer warranty that covers staining, fading, and deterioration. What’s more, our highly trained and experienced installers can build your deck in any shape or size that best suits your needs. And you can rest assured that our technicians will always install your decking according to best practices. 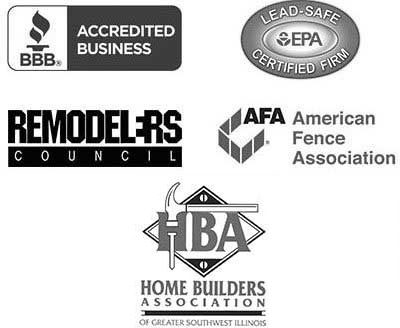 To learn more about the backyard decks Chesley Fence & Deck can offer to homeowners residing in the O’Fallon, IL area, contact us today. Your crew did a wonderful job! My fence looks Beautiful! Thank you.